Calling all Nuns, Goat herders, Baronesses, Parents, Grandparents, and Children! 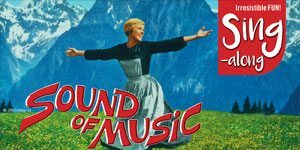 Yodel and sing-along to the most successful movie musical of all time: The Sound of Music. Enjoy a screening of the classic Julie Andrews film, complete with subtitles so that the whole audience can sing along. Feel free to come in character – dress up as anything represented in the classic film – the possibilities are as endless as the sunlight on a perfect Alpine day. Recommended for adults, families and children of all ages. After The Marine Corps, Truhitte continued to perform on stage, appeared in movies, theatre and television. Daniel has achieved fame from Hollywood to Europe for his talented acting, singing, dancing and teaching. Now, Daniel is teaching singing lessons to students in Concord, NC where he lives with his wife, Tarealia.